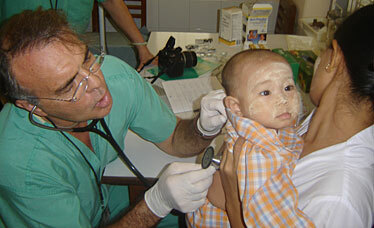 Dr. Michael Healy examined a young patient last month at the Aloha Medical Mission clinic in Myanmar. SAGAING, Myanmar » Gold-tipped pagodas and monasteries dot the hills around this ancient city along the chocolate-colored Irrawaddy River. The peaceful scene contrasts with images of soldiers and police brutally suppressing pro-democracy protests led by Buddhist monks in Myanmar, also known as Burma. » Tomorrow: From vacation to isolation -- In the aftermath of the bloody crackdown on pro-democracy protesters in Myanmar, tourists have stopped coming and people who depend on tourism dollars are worried about their future. Sagaing is where 15 Aloha Medical Mission volunteers operated a free clinic for a week last month at the Sittagu Ayudana Hospital, about a 45-minute drive from Myanmar's second-largest city, Mandalay. They were the first group of foreign visitors to the hospital since the military government's crackdown in September. The hospital, run by a monastic order, depends on outside doctors for surgeries and training for their own staff. But the mission almost did not happen. "It was a decision that wasn't taken lightly. We're not the classic John Wayne type of physicians," said Honolulu pediatrician Dr. Michael Healy. As it turned out, the Aloha Medical Mission volunteers were able to save lives on the mission. Without proper treatment, at least three people, including a 9-month-old infant, would have died, the doctors said. 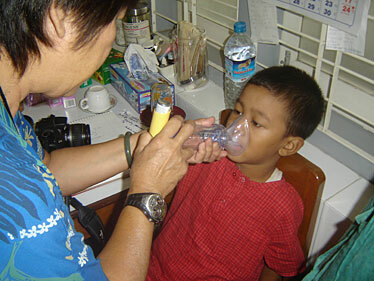 Nurse Celese Ibarra shows an 8-year-old Myanmar boy how to use an inhaler to take his medication. SAGAING, Myanmar » The young monk with a toothache looks a little frightened as Honolulu pediatrician Dr. Michael Healy examines him at a free clinic run by the Aloha Medical Mission at the Sitagu Ayudana Monastery Hospital. Healy prescribes some children's pain medication and makes sure he will see a dentist. "If he's not feeling it now, he will tomorrow," Healy said at the hospital last month. The 7-year-old patient also gets a colorful goody bag, stuffed with toys and candy from Hawaii sewn and put together by volunteers from Fabric Imports in Hilo and other friends of nurse Sonja Gumbs. The boy looks inside and smiles for the first time. "That's why we do this," Gumbs said, "to see a child smile." But this mission by 15 Hawaii doctors, nurses and other volunteers to Myanmar, also known as Burma, almost didn't happen. Just weeks before the mission, Myanmar was the scene of violent confrontations between military government forces and pro-democracy demonstrators, led by monks, in late September. Residents said there were also protest marches in Sagaing and nearby Amarapura although not of the same intensity as in nearby Mandalay, Myanmar's second-largest city, and in Yangon, the former capital. 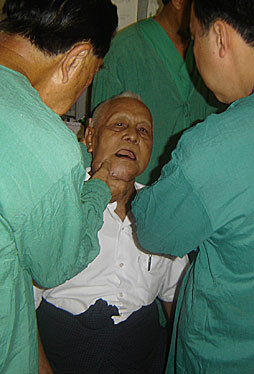 » October 2006: The Aloha Medical Mission begins planning a return trip to Myanmar after a successful first mission. » Aug. 15, 2007: Without warning, the military government cuts fuel subsidies, doubling the price of diesel and gasoline and increasing the price of natural gas by 500 percent. The cost of food and other goods also rises in what the United Nations estimates is one of the 20 poorest countries in the world. » Aug. 19: A small group of dissidents protests the price increase and is arrested. 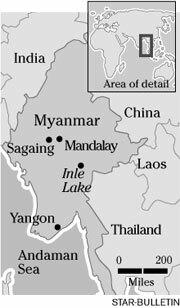 » Sept. 5: Troops injure several monks during a demonstration in Pakokku in central Myanmar. The monks demand an apology, which does not come. » Sept. 17-23: Monks refuse to accept alms from the military and begin marching in Yangon, Mandalay and other cities. In Yangon, some of the monks march to democracy leader Aung Sang Suu Kyi's home, where she is held under house arrest. » Sept. 24: Tens of thousands of monks and civilians in Yangon join what is described as the largest protest march in Myanmar in 20 years. » Sept. 25: The government warns monks and civilians to stop the protests and imposes a nighttime curfew and a ban on gatherings of more than five people. » Sept. 26: Police and military troops use force to break up the demonstrations and begin arresting protest leaders and others who took part in the demonstration. Several monks are killed. Japanese journalist Kenji Nagai is killed covering a demonstration near the Sule Pagoda in Yangon on Sept. 27. » Sept. 28: Internet access to Myanmar is cut off by the government. » Oct. 3: The Aloha Medical Mission receives word from the Sitagu Ayudana Hospital that the situation is stable in Sagaing and it is safe for the volunteers to come. » Oct. 15: After talking it over among themselves and with family and friends, the 15 Aloha Medical Mission volunteers finalize plans to go to Myanmar. » Oct. 20: Aloha Medical Mission volunteers arrive at the Mandalay airport and drive to Sagaing. The Internet and other means of communication were cut off, and the mission remained in limbo until word came that it was safe for the Hawaii volunteers to come. Then the volunteers had a decision to make: cancel or continue on. "We know the people here are waiting for us. We know the patients have already been scheduled, and it would be a disappointment if we didn't show up," said Dr. Carl Lum, a surgeon who led the mission. "I probably had 40 or 50 phone calls telling me not to go," said anesthesiologist Dr. Steve Garon. "What was going through my mind was mostly my family and my wife," Healy said. "I had to square it with my wife." In 24 years the Aloha Medical Mission has gone to disaster areas and places where there have been coups and rebel activity, but only one mission was canceled, after a bomb went off in the Philippines, Lum said. The 15 volunteers on the Myanmar mission discussed it and voted to proceed. "We thought it would be helpful to the people here to see the outside world cares," Healy said. "We thought, as we e-mailed back and forth, we could maybe bring a little bit of hope." Kuakini Medical Center's Dr. Myo Nwe, who was born and raised in Myanmar, said he would have come regardless of what the group decided. "I want to give back, my knowledge back, to the people from Burma," he said. Nwe quickly became the most sought-after doctor in the clinic as word spread in the surrounding communities that a doctor who could speak Burmese was among the foreigners treating patients. The mission, Nwe emphasized, was not about politics, but about helping people, especially people from rural areas who might not otherwise get a chance to see a doctor. The volunteers were worried at first that patients would be afraid to come to the clinic because of the recent protests. But there was no sign of any military or police presence during their visit to the monastery-run hospital. People lined up for the clinics, and the numbers increased as the week went on. The volunteers, who pay their own way on the missions, treated about 300 people in the free Aloha Medical Mission clinic from Oct. 20 to 27, Lum said. Some volunteers who were on the Aloha Medical Mission's first visit to Myanmar last year also noticed there were fewer monks on the hospital grounds. The volunteers said they were told that many monks went back to their home villages until they felt it was safe to return to the monastery. Dr. Carl Lum and Dr. Andrew Oishi examine a 77-year-old man with a large facial tumor who drove 200 miles to see the doctors from the Aloha Medical Mission. The patients doctors saw ranged from a 77-year-old man with a large facial tumor, who drove more than 200 miles with his family to see the American doctors, to a 9-month-old baby with infected second- and third-degree burns. Healy said he came across the infant during a morning walk on the hospital grounds. "The mother was obviously looking for help," he said. Without antibiotic treatment and burn medication, he said, the infant could have died. Lum saw a 57-year-old man from a nearby village who said he had lived with a thyroid tumor for 17 years. Over the last three years, the tumor had grown to about the size of a grapefruit. But the man said he hadn't seen a doctor because it hadn't affected him. He could still talk, eat and breathe without difficulty. Medical treatment is free, and patients pay only for drugs and are asked for a donation only if they can afford it. But people are still reluctant to see doctors, Nwe said. "It's a cultural thing," Nwe said. "They don't want to die in the hospital," he said. Dr. Andrew Oishi said they operated on the man for five hours and removed the tumor. His prognosis is good. Altogether, Oishi and Lum performed 55 major surgeries -- most involving tumor removals. Power, which is unreliable in Myanmar, would go out several times a day, and the operations would stop for several minutes until the electricity returned. Critical functions like oxygen and monitors for vital signs were on battery power and continued while the surgical team paused. During an especially complex procedure involving the removal of an ovarian tumor about the size of a large papaya, local doctors crowded around Oishi, discussing procedures and the best way to proceed. The tumor turned out to be benign, and the 27-year-old woman has a good prognosis, Oishi said. Teaching and sharing knowledge is a key part of the mission, said Oishi, a Kuakini Medical Center surgeon and an assistant professor at the University of Hawaii medical school. At lunch the next day, Oishi thought aloud about the possibility of setting up an exchange to bring some of the Myanmar doctors to Hawaii for training. "We need their help and they need our help, and we want to leave behind training and skills," Garon, the anesthesiologist, who also trained doctors on anesthesiology techniques, said. Oishi and Lum also performed emergency surgeries on two patients -- including a 73-year-old monk with a perforated stomach ulcer. "I always feel that if you can save just one life on a mission, it makes it worthwhile," Lum said. Lum said the group was invited back next year. "Everybody is very enthusiastic about going back," he said. 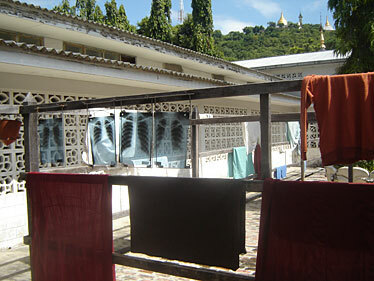 X-rays dry in the sun next to monks' robes at the Sitagu Ayudana Monastery Hospital in Sagaing. Mission volunteer Paula Hefrich, who was raised in Myanmar and speaks Burmese, said she's hoping to expand the mission to include training for nurses and perhaps recruiting engineers who can help build a solar electrical system for the hospital. "As far as the things that we did and the type of patients we took care of that wouldn't have gotten help otherwise, it was really satisfying," Oishi said. "I think it kind of helped them given the type of situation they went through," he said. "I sort of feel they were really in need of some hope." Editor's Note: Star-Bulletin reporter Craig Gima's travels were partially paid for through the World Affairs Journalism Fellowship, a program administered by the International Center for Journalists in Washington, D.C., and funded by the Ethics and Excellence in Journalism Foundation in Oklahoma City. For more information, visit icfj.org.